Today I bought a new set of flower cutters , so as all kids do I wanted to use them immediately :-). 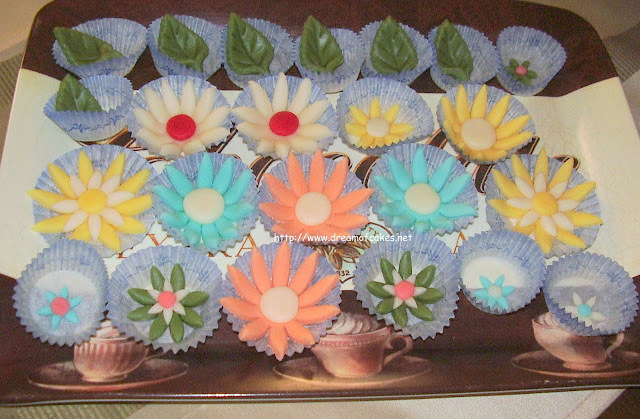 I made quite a few daisies and some flower leaves, which I think I will use in decorating a birthday cake. It is easy to use gumpaste as long as you work fast. 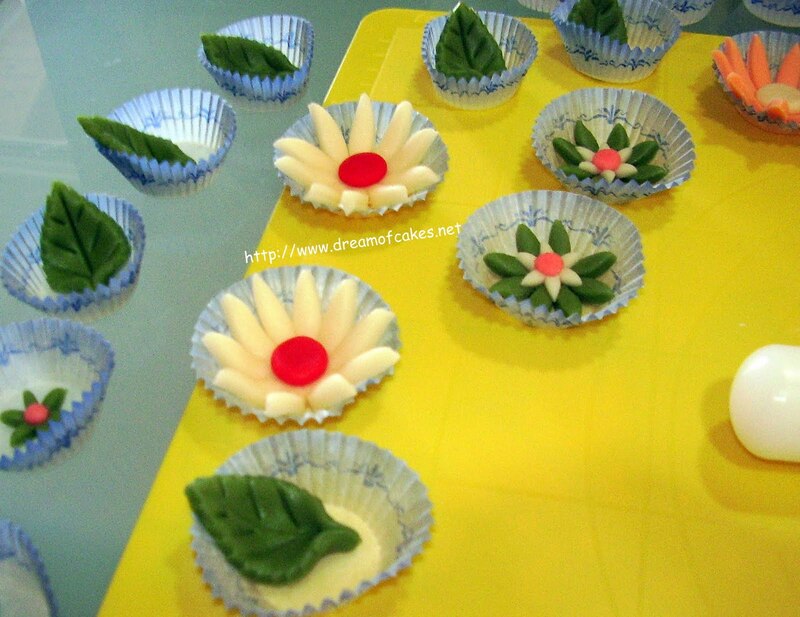 You can make it using a traditional gumpaste recipe or by incorporating gum tragacanth into your fondant. I find Tylo powder a quick and easy way to form gumpaste. Below you can read what I used to make my flowers. - For every 200gr of fondant you will need 1 teaspoon of Tylo powder. - Tylo powder makes fondant become hard, so you have to work fast. - Incorporate the Tylo Powder into the fondant and cover with clean film. 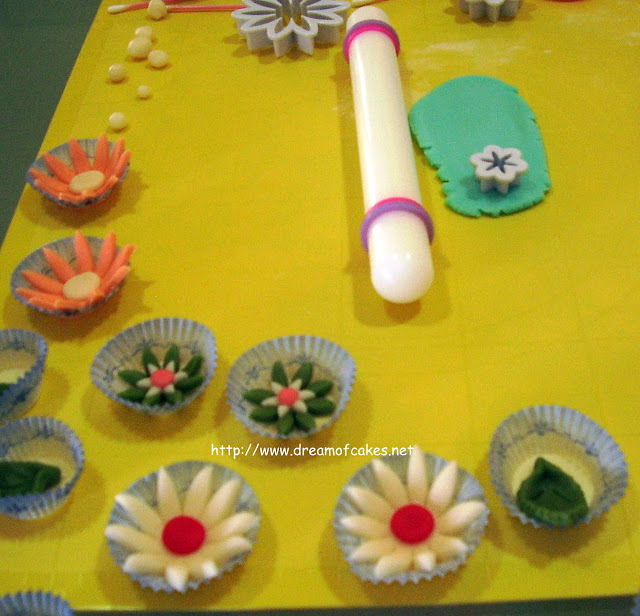 - Use the rolling pin and flower cutters to form the flowers. - Remove the gumpaste from the cutters with the use of a cotton bud or a toothpick (cotton bud works better). - You can use them immediately or after several days. They are so pretty. I know exactly what you mean, whenever I get the moment to play with gum paste, I just turn into a kid all over again - it really is so much fun. They are so pretty. Sad to say I haven't got the patience or the skills to do these things. I so admire your work. Adorable!! I've never used gum paste,but you made it look fairly easy! Nicely done! oo, pretty flowers! i'm still a little intimidated by gumpaste, but yours are so nice! can't wait to see the cake you make with them! Beautiful! how creative and fun. You are so talented! Mine would likely look like wilted flowers. LOL. Can't wait to see the cakes you create with these! Love the idea of using cupcake papers to shape large flowers - never thought of using them. 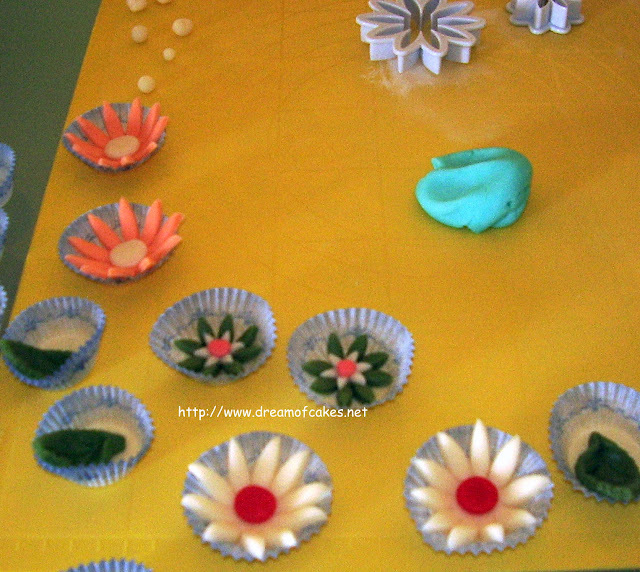 I have a bit of fondant work ahead of me this coming week - we can compare notes! I can imagine how beautiful your cakes will look! i use the same cutters too! i agree... they are alot of fun. your flowers look beautiful... they would look great on cupcakes! So pretty! You definitely have a talent when it comes to things like this! You are so talented. The flowers are beautiful! These came out lovely! I just bought flower cutters at Michael's the other day--I think they are the same ones. I am going to be trying my first attempt at a fondant covered cake next week--kind of nervous but looking forward to it too! i've been wanting to do this art but don't hv a chance yet. I love to see others work! Simply amazing! Lovely flowers! Isn't it great to get new equipment, I treated myself to some new cookie utters recently and so you have to use them. How cute are these! I think I can do this. So cute! These are awesome! Thanks for Liking my page…and commenting on the blog (of course, our life blood, the comments!) I love your site. You too are very creative!